Cilantro Lime Chicken Salad is the ultimate lunch. 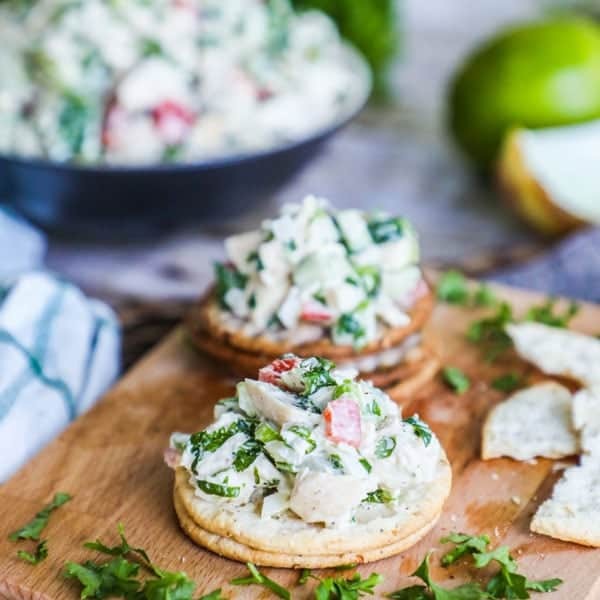 This recipe is so fresh, blending tender shredded chicken with bold cilantro, tangy lime, lots of crunchy flavorful veggies and creamy dressing. You can eat it on a salad, as a sandwich, or fill an avocado or tomato with it. I really love chicken salad. It makes such a great lunch, or a filling snack. The best part is you can customize it with so many flavors so you can often get just what you are in the mood for. 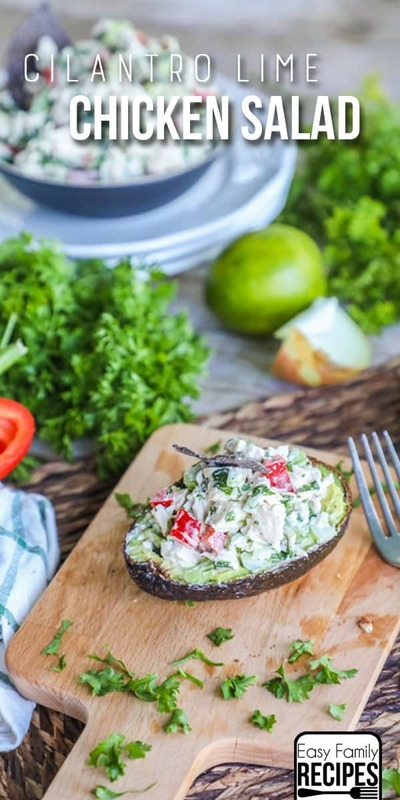 For example I created this Loaded Chicken Salad recipe when I wanted the yummy flavors of baked potatoes. And this greek chicken salad and ranch chicken salad were perfect for flavorful options when we did the Whole30 diet. It seems like whether you want classic chicken salad or something a little different, it all tastes great when mixed with chicken and that signature creamy dressing. 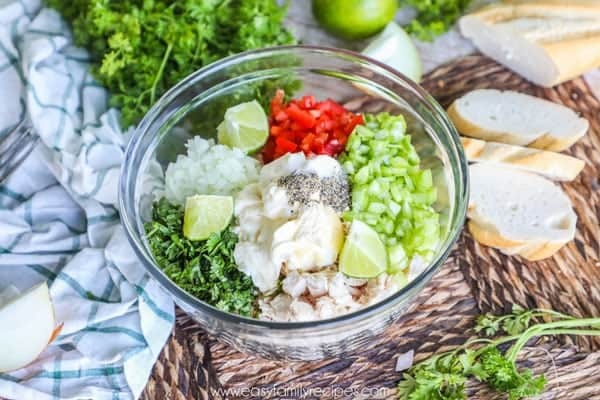 Cilantro and lime are pretty much a flavor match made in heaven and I have been wanting to make them into chicken salad for a long time. After a long multi month move this summer, I am just craving fresh, light, healthy foods and this chicken salad really hit the spot. Like a traditional chicken salad, the base is tender shredded (or chopped) chicken and mayonnaise. I don’t like mine super heavy so I go light on the mayo. Also, to keep it on the light side I pack my full of veggies. Since the chicken and dressing are higher in calories, this allows you to eat bigger portions for less calories and more nutrients. You can adjust the quantities of these up or down to your taste preferences. Follow along with my step by step recipe below where I share all of my notes, tips and tricks on making this recipe. If you just want the quick version, you can scroll down to the bottom of the post for the printable recipe card. 3 cups shredded or chopped chicken breast– my favorite thing to use is absolutely rotisserie chicken, but if you don’t have any on hand, you can bake chicken breast with olive oil, salt and pepper at 350˚F for about 20-25 minutes (165˚F internal temp) and then shred, or boil chicken breast then shred it. 3/4 cup mayonnaise- Please use real mayonnaise! You need a nice neutral base to grab all of the great flavors in this. If you want a lower fat option you can try greek yogurt but it isn’t quite the same. 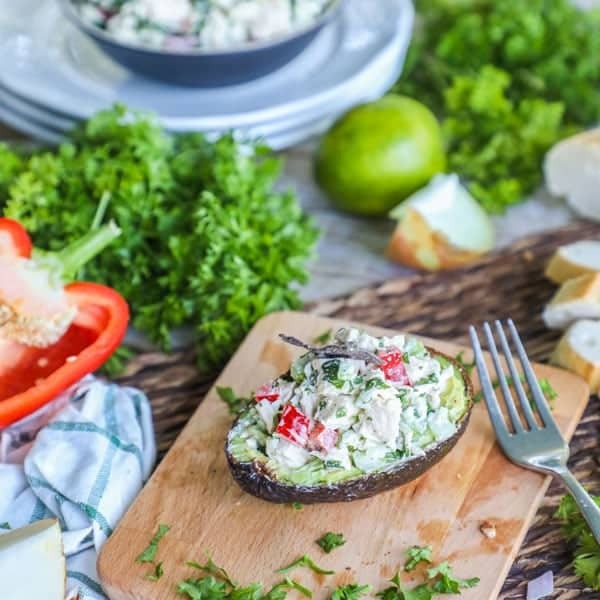 1 cup celery, finely chopped– As I mentioned above, I really like to load up my chicken salad with tons of veggies to get a lot more fiber, nutrients, and lower the calories per serving without sacrificing taste. If you prefer a little less, you can most definitely half the amount of celery here. 1/2 cup yellow onion, finely chopped- I like to chop the onion up really fine so that the flavor doesn’t stand out. The lime juice helps mellow the bite of the onion and when finely chopped it adds great flavor without tasting oniony at all. 1 red bell pepper finely chopped- You can use any color sweet pepper you want. Go for green, orange or yellow if you like that best. I think the red tastes good and looks extra pretty so that is what I use! 1/2 cup chopped cilantro- Chop both the leaves and the stems as cilantro stems have lots of flavor too. Make sure you chop it pretty small so that it blends well and is easy to chew! Juice of 1 lime- Use more or less to taste. Combine the mayonnaise, with the garlic, salt, pepper, and lime juice and mix. 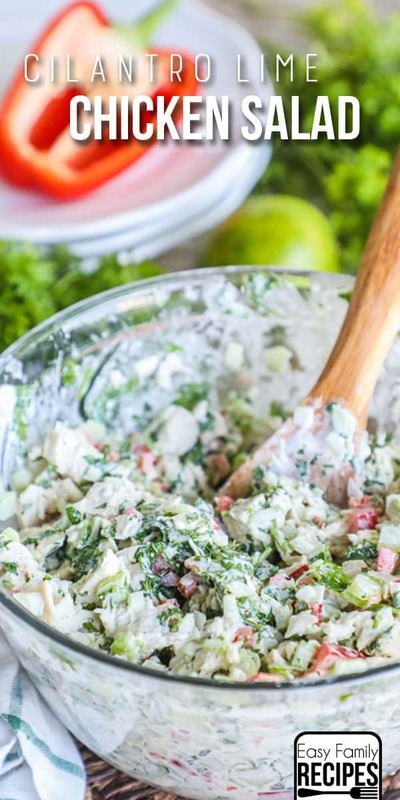 You can skip this step if you are in a rush and just mix everything at once, but I really think this is a better way because it helps to get all the flavors evenly distributed throughout the chicken salad. In a large bowl, stir the chicken, celery, onion, bell pepper, and cilantro with the mayo mixture until everything is coated. Make sure that all the veggies are chopped up nice and small so that it is easy to eat and picks of the flavor of the dressing. Chill for 1 hour for flavors to meld. Of course, you can start to gobble it right away but the flavors will really come together after sitting for at least an hour so I recommend that. 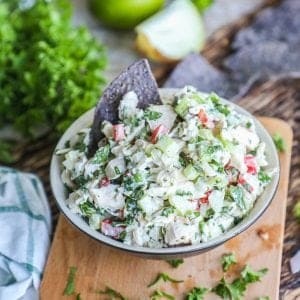 I really hope you enjoy this Cilantro Lime Chicken Salad recipe as much as I do! If you get a chance to make it, I would love for you to leave me note and let me know what you think. I love hearing that others are making my recipes and it warms my heart to read about it. Or if you are on Instagram, snap a pic and tag me @easyfamilyrecipes so that I can see what you are cooking up! 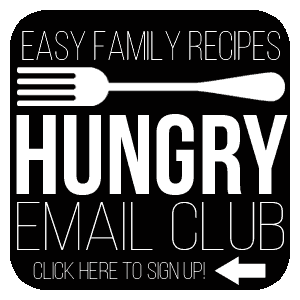 If you love easy and delicious recipes as much as me, I would love for you to join me in my Hungry Email Club. I send out new, delicious, and of course EASY recipes each week! Sign up here or click the button below. This cilantro lime chicken salad is simple to make and full of fresh bold flavors. It makes a great lunch or snack when served on chips, crackers, tortillas, or stuffed in an avocado or pepper. This recipe is naturally gluten and dairy free. Combine the mayonnaise, with the garlic, salt, pepper, and lime juice and mix. In a large bowl, stir the chicken, celery, onion, bell pepper, and cilantro with the mayo mixture until everything is coated. Chill for 1 hour for flavors to meld. Keep leftovers in an airtight container in the refrigerator for up to 3 days. Stir before serving.